Those statements appear to be false. Poroshenko said the offshore companies, identified by OCCRP and Slidstvo reporters on April 3 in the massive Panama Papers confidential data leak, are related to his efforts to put his candy company, Roshen Confectionery Corp., in a trust. That explanation was repeated several times between April 4 and 10. But a check of the company registry in Cyprus has revealed financial transactions that cast doubt on the president’s version of events. On March 25, more than a week before Poroshenko’s offshores were first revealed by OCCRP and Slidstvo, records indicate that nearly € 4 million was moved out of Ukraine to a Poroshenko company in Cyprus, in a combination of cash and in-kind payment, in a likely violation of the National Bank’s currency control regulations. One month later, on April 27, Swiss Rothschild Trust AG became the company’s shareholder. The president’s advisors deny that extra money was moved offshore, saying they only moved the equivalent value of the stock shares. 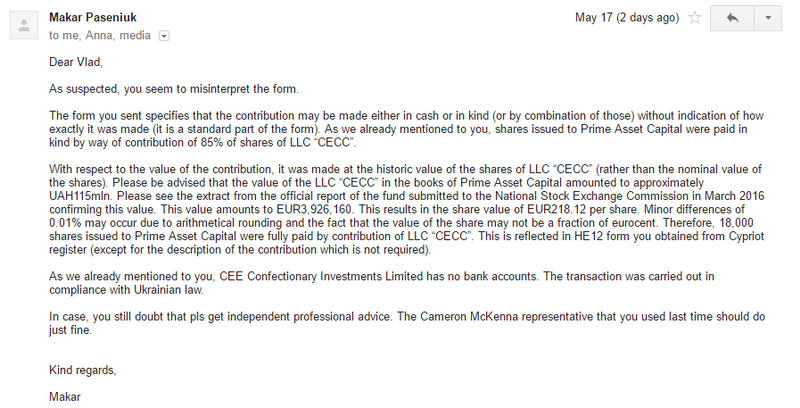 At the heart of the controversy are newly discovered documents from the company registry in Cyprus for one of Poroshenko’s offshore companies, CEE Confectionery Investments Ltd., which at the time was owned by another of his BVI companies: Prime Asset Partners Ltd.
On March 25, CEE Confectionery issued an additional 18,000 shares with a value of € 1 each to bring the company’s total shares issued to 20,000. That same day, those shares were sold to Poroshenko’s Ukrainian fund, Prime Assets Capital. But while the shares were valued at € 18,000, they were sold for € 218.12 per share, or € 3,926,160. The Ukrainian company paid for the shares with a transfer of cash and assets, in effect moving Poroshenko’s money from Ukraine to Cyprus. Elena Constantinou, of Elena Constantinou Law Office in Cyprus, points out that the Type of Payment field actually has two entries. This directly contradicts the claims of the president’s advisors. Several other lawyers who reviewed the documents agreed that they show the Cyprus shares were paid for by a Ukrainian company. Transfers of this kind, where money leaves Ukraine, require a permit from the National Bank, which currently limits such transactions to US$ 50,000 a month to prevent capital flow out of the country. Leonid Antonenko, a board member with the Ukrainian Bar Association, was in charge of the National Bank’s registration and licensing department in 2015 when the permits were issued: “Such investment needs the license. Otherwise, such transaction is impossible,” he says. Moreover, he refers to the National Bank’s March 3, 2016 decree that does not allow foreign investment out of Ukraine even for the license holders. The National Bank of Ukraine would not say whether Poroshenko’s fund obtained the necessary permit. Antonenko noted, however, that such license would not be necessary in case of an in-kind transaction. After reviewing OCCRP’s documentary evidence, Antonenko says he can’t understand how such a transaction was possible. But Makar Paseniuk, the managing director of ICU, a Kyiv-based investment company that serves as Poroshenko’s financial advisors, says that the new shares weren’t paid for in cash but by equivalent shares in Poroshenko’s Ukrainian company that holds his confectionery assets. According to Paseniuk, the 18,000 shares were paid for by Poroshenko’s fund, with 85 percent coming from the Central European Confectionery Company, a Ukrainian LLC that holds Roshen’s assets. The Ukraine company registry entry from March 24, 2016, one day prior to the offshore transaction, said that the fund’s share in the statutory capital of Central European Confectionery Company equalled Hr 510,850, or € 18,000 at current exchange rates. Paseniuk, however, says that the contribution to the Cyprus company was made not at the nominal, but at “historic” value of the shares, amounting to € 3,926,160. He did not explain why the historic value was about 200 times higher than the new shares’ valuation of € 18,000. He says that on the key day, March 25, Poroshenko’s Ukrainian fund transferred all the newly issued shares and paid-up shares to BVI’s Prime Asset Partners, which is solely owned by Poroshenko. Paseniuk said that the Ukrainian fund received Prime Asset’s shares in exchange. The transactions were needed as part of “corporate restructuring” prior to putting the shares of Cyprus company into a trust, he added. Poroshenko’s advisors later sent unsigned copies of an agreement to local media which they said showed they were telling the truth but key information on beneficiaries, powers of attorney and two sections describing how the transfers were to be made were deleted raising even more questions as to what happened. Speculating about possible reasons for the March 25 transactions, Andriy Gerus, financial expert says that the Cyprus company most likely needed some operational funds. If the lawyers’ interpretations are correct, the president would have violated the law. Regardless of why Poroshenko’s Ukrainian company needed to transfer nearly € 4 million to Cyprus a month before Rothschild Trust appeared as its shareholder, the transaction appears to contradict numerous statements made by the president and his advisors following the release of OCCRP’s President Poroshenko Offshore Tax Plan investigation on April 3. On April 4, the Kyiv-based law firm Avellum Partners, which worked on Poroshenko’s offshore deal, claimed that the registered offshore firms “didn’t open the bank accounts” and “didn’t conduct any financial transactions.” The same claim about the three Poroshenko companies having no bank accounts and conducting no “active transactions” was repeated on April 8 in a statement by Paseniuk, two weeks after the transfers took place. And on May 17 he said again that none of the companies have banking accounts, when providing comments for this story. The latter statement is contradicted by documents found in the Panama Papers, confidential business records of the Panamanian law firm Mossack Fonseca, obtained and shared with the international Consortium of Investigative Journalists (ICIJ) and OCCRP by Süddeutsche Zeitung, a German publication. The documents show Poroshenko as a direct shareholder of the BVI-registered Prime Asset Partners holding 1,000 shares with a par value of US$ 1 each. Immediately after the April 3 article, Poroshenko vowed to implement an election promise by proposing new laws to stop the siphoning of Ukrainian assets offshore. Recent data indicates that from 2004 to 2013, the Ukrainian economy lost US$ 11.6 billion, or nearly a quarter of the country’s budget, through the use of offshores. To date, no such proposals have been submitted to Parliament. On April 8, after repeated OCCRP requests to make the text of Poroshenko’s trust agreement public, Poroshenko’s financial advisor Paseniuk invited Dmytro Gnap, an investigative reporter with OCCRP member Slidstvo.info, to his office. Gnap says ICU employees “took away all (my) recording devices and also tried to take away the notes I made while reading the document.” Gnap had to sign a written promise not to disclose the document’s content as a condition for gaining access, and says he was shown a document that was only signed by one party. “I think that, without doubt, it should be published, so that both journalists and lawyers stop speculating and are able to study it and make their expert conclusions with documents in hands,” he says.